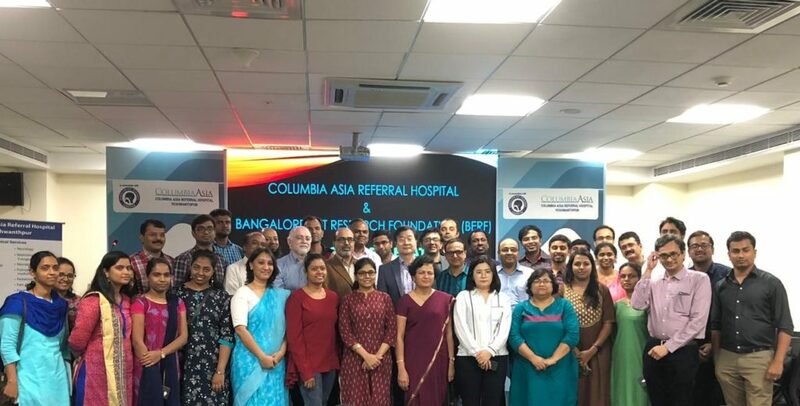 Columbia Asia Referral Hospital Yeshwanthpur conducted a two-day Rhinoplasty workshop on 9th and 10th February 2019 where 6 Live Rhinoplasty surgeries were performed. The surgical procedure was performed using latest minimally invasive techniques, implants and advanced technologies in the field of ENT. The surgery was performed live to provide an educative experience and help in creating awareness among the E N T postgraduate students, practicing ENT consultants and Plastic Surgeons. Prof. Dong Hak Jung, from South Korea was invited as the Guest Speaker who also performed one of the live surgery. Prof. Jung is a rhinoplasty surgeon specialized in facial plastic and reconstructive surgery of otolaryngology. He has handled more than 50,000 cases in facial and rhinoplasty surgeries. Along with Prof. Dong, Dr. Manjunath M.K, Dr. Subramanaya Rao, Dr. Sreenivasa Murthy TM and Dr. Chidananda D R, consultant ENT specialists at Columbia Asia Referral Hospital Yeshwanthpur performed the live surgeries. 90 delegates across India and overseas attended the event to understand the advanced trends in the field of Rhinoplasty. “Rhinoplasty is the most common cosmetic surgery today. The surge in this procedure is enhanced by progressive treatment modalities from utilizing advanced suture materials, accessibility to good quality implants and the refinement in surgical techniques” said Prof. Dong Hak Jung, Guest Speaker, Shimmian Rhinoplasty Clinic, Seoul, South Korea. This workshop was an opportunity to interact and exchange knowledge on the surgical front. During the live surgeries we had interactive sessions for better understanding on the surgical procedures.” said Dr. Chidananda DR, Consultant ENT, Columbia Asia Referral Hospital Yeshwanthpur. Professor Dong’s session on Surgical Rhinoplasty has provided the delegates with a broader perspective on global procedures.